Fathers Day thoughts about the sad reality of aging. Dad has traditionally been the rock of the family. Unfortunately, the sad reality of aging often means others must now assume that role. This can feel especially poignant on Fathers Day. You may feel the stress of caregiving combined with the sadness associated with this loss. Longing for the dad you used to know often leads to a feeling of sadness and bewilderment. David York Agency can prevent you from feeling overwhelmed. We are totally acquainted with all the stages of aging and its associated care. We ease the way by providing compassionate, quality home health aides to the aging client as well as seasoned advice to family members. Our aim is to enable you to enjoy your elderly father as much as you can for as long as you can! Follow our blog for more advice on how you can care for an elderly loved one. 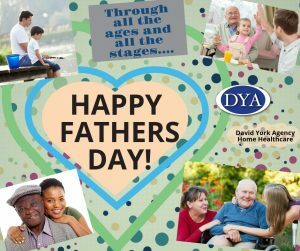 For more information about David York Agency’s qualified, compassionate caregivers, please contact us at 718.376.7755. If you’d like to hear more from us, please like us on Facebook or follow us on Twitter, Google+, or LinkedIn. PreviousPrevious post:Ageism: Lack of Smoking InterventionNextNext post:Happy Father’s Day in Brooklyn & Beyond!